This card cannot be Special Summoned. This card returns to the owner's hand during the End Phase of the turn that it is Normal Summoned, Flip Summoned, or flipped face-up. When this card inflicts Battle Damage to your opponent's Life Points, your opponent skips his/her next Draw Phase. dawnyoshi Oh great. Demon Spawn, AKA Yata. 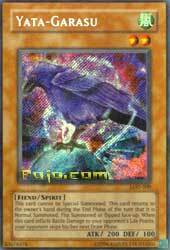 The most overused, over abused, and overrated card in yu-gi-oh. Sure, this thing is a monster in a focused control deck, but it's got weaknesses, believe it or not. D.D Designator, control cards, even chain disappearance...and the bird's most often seen in a cookie cutter control deck, which makes no sense whatsoever. Wow, how boring and ineffective. Bottom line: don't use this card in a non-control deck. Don't use this with CED, as it's just mean. Just ignore this card and pretend the Japanese ban list is in effect. ...Why? It's 200 ATK, and your opponent probably won't be burning their hand away. This thing is worthless in limited. Well, the previous CotD review team already did this card when Legacy of Darkness came out, so instead of reviewing the card as a whole, I'm going to review what's changed between LOD and IOC. LOD: Everyone pulled their pre-negators out of their trade binder...Delinquent Duo, Confiscation, and The Forceful Sentry were flying everywhere. Complete n00bs threw this card in their deck...and actually won some games with it. It's THAT powerful. PGD: Don Zaloog made sweet love to Yata-Garasu down by the fire. Donny was just one HUGE step in setting up the lock, dropping cards from their hand before the peck. MFC: Yata didn't get any direct help, but people were playing Tribe-Infecting Virus in multiples. Discarding cards from hand for an effect did some of Yata's work for him. DCR: No direct help for Yata. IOC: The Chaos Emepror Dragon-Yata lock combo was born. Special summon (through a Reborn card) a Sangan or Witch to the field. Special summon CED. CED's effect goes boom, Sangan or Witch search for Yata, and you attack/lock. However, more and more people have been taking defensive measures against this bird. Fear/Despair from the Dark would be special summoned when discarded from an opponent's hand by a hand destruction effect. D. D. Designator allows someone to name a card and look at the opponent's hand, and if the card is there, it's removed from game.....if the card isn't there, then the person who played loses a card from THEIR hand at random, removed from the game. If they played Yata, you know they have it. So you can easily remove it. And in general, people are being more uptight with their use of cards in hand. Yata's still used in 90% of all tournament-winning decks...maybe 99%. There's not much to say about this card that hasn't already been said. 1) He can't be Special Summoned. This is part of his Spirit effect, something which really needed to be given to Yata; otherwise, he would be more broken than he already is. It's a pretty basic effect: no Kamakiring, no Reborning, nothing. 2) He returns to your hand the turn he's summoned. This was supposed to decrease the playability of Yata; it prevented you from keeping Yata on the field while you continuously summoned other monsters in order to smash your opponent. In a way it helps him, however, as now your opponent's Raigeki (along with many other cards) is completely worthless. 3) When he does damage to your opponent's Life Points, your opponent doesn't get to draw next turn. If your opponent can't keep you from attacking with Yata, you can repeat the process until you've pecked away all of his Life Points; this is the Yata-Lock. There are a few combos, most of which involve clearing your opponent's hand and field and then pecking away. There’s also the infamous Chaos Emperor Dragon + Witch/Sangan...nuke everything, bring forth the Bird, peck for the win.